L-R: Cheryl D. Dozier, President of Savannah State University; Phillip D. Adams, Vice President for University Advancement and Executive Director of the SSU Foundation Inc.; and Gary Sanchez, Regional Director of External Affairs AT&T Georgia. 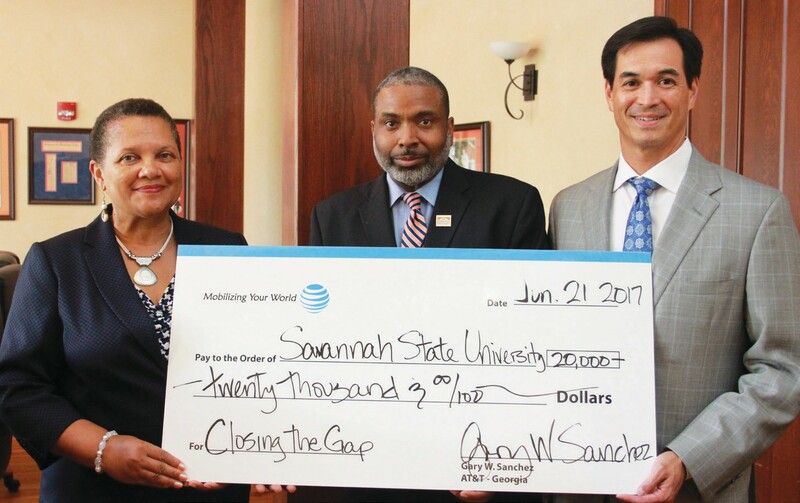 AT&T regional office made a $20,000 donation to Savannah State University’s (SSU) “Closing the Gap” fund. Gary Sanchez, regional director of External Affairs AT&T Georgia, presented the check to President Cheryl D. Dozier on June 21 during a brief campus visit. The fund was started by President Dozier and provides financial support to students in their final semesters to ensure they complete college. Students are eligible for a one-time award of up to $1,500.